Long ago, when the whole universe was filled with a great ocean, Lord Vishnu was sleeping on his bed of Adisesha, floating in the middle of the ocean. From his ear wax, two Asuras named Madhu (मधु) and Kaitabha (कैटभ) were formed. They fed on the ocean-water and grew strong. The twins began to wonder, “What is this happy place, where we have been born? What is the name of this boundless ocean that nourishes us? How were we created? Who are our parents? How come we have absolutely no knowledge about any of these things?”. The began to wander here and there in search of answers. Madhu and Kaitabha became arrogant with a sense of their own importance. The roamed here and there on the ocean, sporting with the various water-based animals. While wandering in this fashion, they came upon Lord Brahma, who was doing his task of creation, sitting on a seat made from a lotus. By the grace of Devi, Vishnu awoke. Yawning widely, he opened his eyes and saw Lord Brahma in a posture of supplication, quaking before him with terror. “O Lord who was born from a lotus, what has caused you to come here in such a fashion? Why have you interrupted your task of creation to visit me? You appear to be in mortal fear of something. What has caused this terror in your heart?” asked Vishnu. The battle began. It was a wrestling match to behold. When Madhu got tired, Kaitabha would engage Janardhana in battle. This great battle stretched for five thousand years. 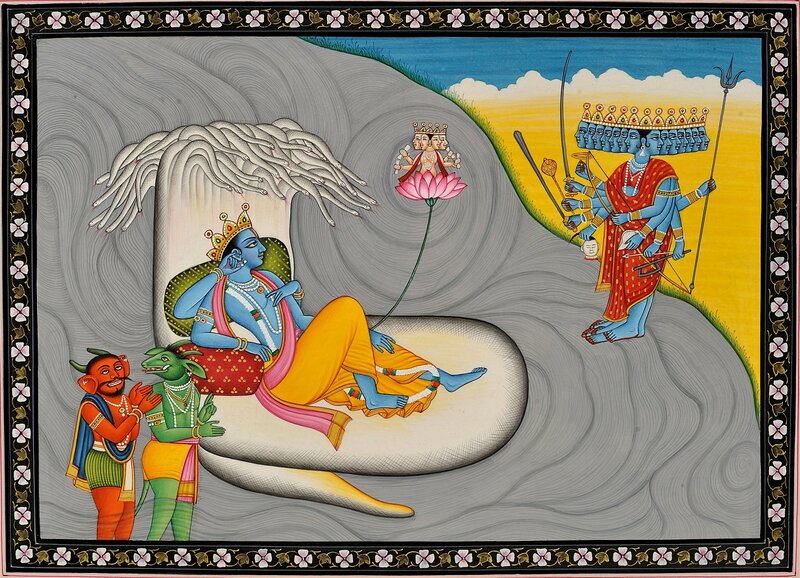 Vishnu was surprised at his inability to destroy these asuras. He then divided that these two Asuras have obtained the boon of invincibility from Devi. While he was still battling them, he started to pray to Devi, to show a way to slay these Asuras. Devi appeared in the heavens above the battleground. Fighting with two hands, Vishnu joined his other two hands in worship for the eternal Goddess. He beseeched her to show a way to overcome these Asuras, who have become strong as a consequence of Devi’s boon. True to her word, she cast a look mixed with false-affection, on the two asuras, causing their baser instincts to awaken. The Asuras fell under the spell of Devi. Too late, the Asuras perceived that they had been tricked. However, there was nothing to be done now. They had promised to grant a boon and were bound by their promise. The just had one stipulation to make. They did not want to die on water. Vishnu said, “So be it!”. He then took up his Vishwa-Roopa (A boundless form, immeasurably immense). He then placed the two Asuras on his massive thighs and beheaded them with his Sudarshana-Chakra (discus). From the body fat of the dead asuras, the land was formed. Since it was formed from an unclean source, the soil is not fit for consumption.